We don’t usually begin lead stories with a table, but this one is compelling. 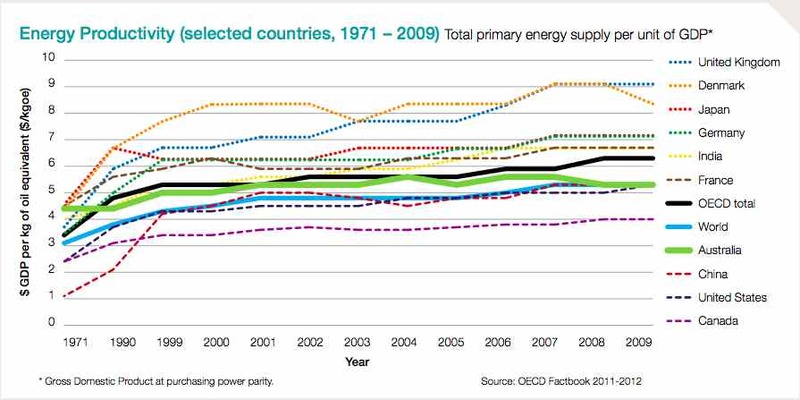 It shows how, over the past 40 years, Australia has sacrificed its position as one of the most energy productive economies – and therefore one of the cheapest – to become one of the least efficient, and therefor one of the most costly. And it all came about because the country got lazy. Australia still has vast coal reserves, but the cost of delivery has soared to the point that consumer electricity prices have virtually doubled in the last five years. And now it is about to deal with a doubling, or even trebling, of gas prices. This is clearly having an impact on Australia’s competitiveness, but the nation’s energy productivity hardly figures in any of the major economic reforms that are currently under consideration. This is the major theme of a two-day conference in Sydney dubbed 2XEP, which stands for double energy productivity, a target that the energy efficiency industry says should be adopted in Australia (double the productivity by 2030), because all other major economies are doing the same thing. Australia, though, has hopelessly inadequate rules and regulations on efficiency – be it for buildings, transport or electricity generation. Alan Pears, a professor from RMIT, noted that building regulations in Australia are at a point where they would not be legal in most other countries. But Australia’s attitude to efficiency is long dated. Robert Hill, a former environment minister in the Howard government and now at the US Studies Centre, made a few interesting points at the conference. One was that his efforts to introduce stricter emissions targets on vehicles in Australia would destroy the Australian car industry. Now, the irony is, the country’s inability to produce energy fficiency vehicles was a likely contributor to downfall of the industry. The US car industry, meanwhile, is booming, particularly around low emission vehicles from the big 3 carmakers, and Tesla. (He noted that he was also responsible for helping to introduce the first renewable energy target. He said that he was told at the time that even a 1.5 per cent renewable target would “destroy” the Australian economy. Now, he noted, the target was for a minimum 20 per cent and his home state was over 30 per cent. Still, the alarmism continues). Hill said he had no doubt that the federal government would reach the 5 per cent emission reduction target through “Direct Action.” The bigger question was what happens after 2020 – (or even with a higher target) – and “how much public money” can be thrown at a higher target. He suggested tighter regulation – through those much derided emission targets for cars, buildings, renewables – would be needed. This appears to be the premise that underpins the attitude to the current government’s position on renewals and energy efficiency. The prospect of “megawatts” – as we highlighted on Wednesday” – is a terrifying one to many in the industry and on the conservative side of politics which, as Hill suggested, resist these policies. The official noted that the current review of the renewable energy target would assess the “competing claims” on costs. Jon Jutsen, chairman of the Australian Alliance to Save Energy, says that Australian economic discussion is obsesses about labor costs and red tape, but energy productivity is simply not addressed in an meaningful way. Jutsen says Australia has blown its ability to offer cheap electricity, partly because too much money was invested in network infrastructure, leading to a surge in consumer costs, and partly because it has locked in a doubling, or possibly trebling in gas prices through its massive LNG export investments. He says that much of the $45 billion invested in network infrastructure over the last five years could have been avoided if utilities had “properly understood” customer needs. This would have resulted in lower consumer energy bills. However, Jutsen says despite its importance, the issue of energy productivity is not included in the government’s broader economics agenda. “We have poor energy productivity compared to our (international) competitors,” Jutsen said, noting that it had been increasing at half the rate of our competitors over the last decade. – A national investment incentive scheme for business in all sectors to improve energy productivity, including facilitating greater private sector finance. – Streamlining, harmonising and extending existing energy efficiency schemes such as the NSW Energy Efficiency Scheme and the Victorian Energy Efficiency Target. – Minimum fuel economy standards for passenger and light freight vehicles, consistent with other developed nations. – Greater development and use of public transport and urban planning to reduce traffic congestion, including through innovative financing and road charging. All of which shouldn’t be, but could be, a major challenge for the government under its current policy directions. The Direct Action policy is likely to absorb the various state based energy efficiency targets, raising questions about whether any such savings would be “additional” to what would have happened. And it seems the Abbott government is determined to focus its infrastructure on the building of yet more roads – even to the point of pushing state governments to sell energy infrastructure to provide the funds for more tarmac. I has suspected that our mighty fearless leader didn’t mean decarbonising the economy in his carrot to the states. If the donkeys in Canberra were serious, energy efficiency and transport energy would be major goals. I see electrical efficiency, while very important, as a less pressing issue than transport, which is almost totally exposed to imported oil with it’s cost and supply issues. Instead, he is thinking more roads will solve the nation’s problems. His brain is stuck in the 1960s. A couple of years ago I was talking to an associate, who specialises in pavement surfacing, about when he thought that peak bitumen may occur. He said it had already happened in Australia and bitumen supplies are often the limiting factor in road construction. Perhaps this is a better use of Canadian tar sands, which come with built in aggregate! Maybe we return to gravel roads?